A Solar Panels or Photovoltaic Cells converts sunlight into electricity. Single crystal, polycrystal and amorphous silicon cells have been employed. The open circuit voltage is about 0.5 V for mono-and polycrystal solar cells and 0.8 V for amorphous cells. Each cell can carry a current between 2 and 3 A. By connecting solar cells in a suitable series and parallel combination, required voltage and current ratings are obtained. The mounting of solar cells in series and parallel combination is known as Solar Panel or Solar Array. Each parallel branch is provided with a diode in order to avoid circulating currents. When a panel consisting of cells in series is used to charge a battery, a diode is connected so that current never flows from the battery to the solar cells. The output of a Solar Panels or Photovoltaic Cells depends on the insolation level (brightness of the sunlight) and the temperature. 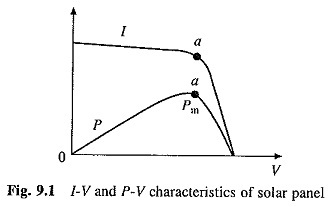 Figure 9.1 gives the 1-V characteristic of a solar panel for a given insolation level. Output power P vs V curve is also shown. At the operating point a solar panel delivers the maximum power (Pm). In Fig. 9.2 I- V curves are given for three insolation levels IN1, IN2 and IN3. The curve abc is the locus of maximum power points. By operating at maximum power points, the output of solar panel can be maximised or for a given power output, the cost of solar panel can be minimised. Therefore, drive is designed so that the Solar Panels or Photovoltaic Cells operates at or close to maximum power points. At present solar cells have low efficiency. The single crystal cells manufactured in India by CEL and BHEL have an efficiency of 10 to 12%. Internationally, commercially available units have efficiency in the range of 12-16%. In laboratories 20% efficiency has been achieved by adding microcrystalline silicon to a solar cell. The cost of solar panels in rupees per peak watt has substantially reduced in the recent past, but it still continues to be high at Rs 100-150 Fig. 9.2 Effect of insolation level on solar panel per peak watt. For low power applications (< 1 kW) permanent magnet dc motor is generally preferred because of its higher part load efficiency. A motor rated around 400 W may have full load efficiency in the range of 77-86% and half-load efficiency in 68-86%. By comparison, typical induction motors of similar power ratings would have efficiencies in the range of 25-65%. Because of high efficiency of dc motors, the Solar Panels or Photovoltaic Cells can have smaller power rating. Therefore, although a permanent magnet dc motor is more expensive than induction motor, the dc drive has much lower cost compared to the induction motor drive. The main problem with dc motor is that it requires the change of brushes after 200 to 400 hrs, and if this is not done, some motors can suffer irreparable damage. Certain dc motors are being offered with claimed brush life of about 10,000 hrs, and these would be better for this type of application. The brushless dc motor is also being used to overcome the problem of frequent brush replacement. For ratings higher than 1 kW three-phase squired-cage induction motor is preferred because of high efficiency, maintenance free operation and long life.